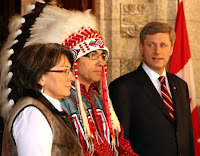 Native Lifeskills & Leadership Training: Harper Apologizes for strategy - "to kill the Indian in the child." Harper Apologizes for strategy - "to kill the Indian in the child." Canada's Prime Minister Steven Harper apologized to First Nations for the 100 year+ institutionalization of Canadas' Aboriginal Children. The infamous Indian Residential Schools of Canada where Aboriginal children, and only Aboriginal children were rounded up and sent to live, work and pray. And hopefully, lose their Indian ways. One half of the kids attending would not live to graduate. Many secret burial grounds for these children are being discovered today. One Elder I know called them 'sweat shops'. My Dad was one of those children. He survived to go on to land on Juno Beach during the D-Day Invasion, and more. It was also a land grab. They won. In BC, anyway. There was the full range of responses to the apology ranging from 'so, what? ', to heartfelt tears being shed and shared. I, for one, experienced relief from Mr. Harper's eloquent and thorough acknowledgement of wrongdoing. It's an important step for the ongoing healing of traumatized First Nation communities in Canada. It's an important development in the maturation process of the country, Canada.